Describe how the immune system evolved over time. Define self-vs. non-self and how this is important for immunology. Define an antigen and what type of macromolecules the body recognizes as antigens. Describe T cells and B cells as the principal players in the host immune response and how they function. Almost all eukaryotic organisms have some way of dealing with the pathogenic microbes in the environment. Even unicellular eukaryotes have mechanisms to defend themselves, although these mechanisms are very simple. In these cases, the cell either keeps the microbes outside or rapidly destroys them once they enter the cell. In many cases, these unicellular eukaryotes (e.g., Paramecium and Amoeba species) actively take up bacteria into digestive vacuoles where they rapidly kill and then degrade the bacteria, releasing the residue as food. As you will see later in this chapter, some cells of the immune system (phagocytes) have inherited this capability. As time passed and evolution proceeded, descendants of these single-cell organisms began to group together and form multicellular organisms. Once an organism becomes multicellular, the game changes a bit. Now, in many cases, there are places inside the organism that must be protected from microbes. Many small worms have a digestive tract and it is undesirable for them to have certain microbes grow there. To this end, the worms secrete a sticky substance that glues the microbes to the sides of the tract, causing them to be pushed along the tube and excreted. Somewhat distantly related systems (e.g., production of antibodies) serve a similar purpose in our bodies. The above systems are crude and not very effective and many individuals of these species fall victim to disease. Primitive multicellular organisms assure the survival of the species by producing many progeny. As long as sufficient numbers survive and reproduce, the species continues to exist. Further down the time-line of life on this planet, the number of cells in organisms continued to increase and so did the size and complexity of the animal. Being a large animal has advantages, such as being better able to defend yourself against predators, having the option of eating smaller folks around you and being better able to forage for food. However, it takes longer for a large organism to reach reproductive age and therefore they need to hold off the horde of pathogens for a much longer time. Guarding the body from infection was now reliant on specialized cells. These protective cells used mechanism of their ancestors, but the much slower generation times of animals demanded the immune system be more effective and sophisticated. The most complex multicellular arrangements are found in vertebrates (e.g., mammals, reptiles and birds, all of which are relatively long-lived species) and it follows that they will have the most complex immune systems. The primitive immunity of non-vertebrates is generally called innate immunity. Vertebrates have retained innate immunity, while adding the adaptive immune response. The point of the above discussion is to illustrate why mammalian immune systems are some of the most complex and how they have evolved over time from simpler defense systems. As each new function evolved, it was added to the capabilities that were already there. In most cases the old functions remain and still serve a useful role, resulting in mammalian systems having many layers to them. This may explain why immunity is a patchwork of different systems, some of which overlap in their duties. A central part of the job of the immune system is to differentiate self from non-self. In other words, invading pathogens must first be differentiated from the background of the host. When the immune system fails at this function, really bad things happen, including autoimmune diseases (when the immune system attacks the host) and even death. At the macroscopic level, the difference between a human and a bacterium is obvious, but at the molecular level, this is less clear. We are made of the same basic building blocks of protein, sugars, DNA and lipids. Yet the host must be able to tell its own macromolecules from those of invading pathogens. So how does the organism figure this out? Innate immunity and adaptive immunity do it differently. Innate immunity recognizes classes of molecules that are only found in microbes, like flagellin (a flagellar protein) or lipopolysaccharide. The recognition of these molecules then triggers a response. Adaptive immunity recognizes macromolecules that are not â€œselfâ€ and then mounts a powerful response. Below we explore these ideas in more detail. A key to the recognition of non-self by innate immunity is the presence of receptors on the surface of cells that respond to macromolecules produced by microbes. The cell must have many different receptors to combat the many different kinds of pathogens (gram-negative and gram-positive bacteria, fungi, and protozoa) it encounters. The structures found on these pathogens can be quite different and it is not surprising that they are recognized by different receptors produced by the immune system. In contrast to adaptive immunity, many of the ligands that innate immunity responds to are carbohydrates and lipids. Macrophages have many receptors like this that work in concert with the complement system to bind pathogens. Receptors that recognize carbohydrates are called lectins and two examples that are found on macrophages are the mannose receptor and the glucan receptor. Macrophages also contain one kind of a very important class of molecules, the Toll-Like Receptors (TLR). See Table 15.1. Toll-like receptors (TLR) are a family of receptors, each of which bind to a different class of microbial macromolecule. TLRs are found in invertebrates as well as vertebrates indicating that this is an ancient system for detecting infection. TLRs have two domains, an extracellular domain that binds to the target molecule and a cytoplasmic signaling domain that communicates activation of the TLR to the inside of the cell. Crystal structures have revealed that the extracellular domain of the TLR has a horseshoe-like shape, where the target binds. Humans have 10 TLR genes and each TLR will respond to a certain class of molecule present on pathogens, but not found in human cells. For example, TLR4, found on macrophages, responds to the LPS of gram-negative bacteria and other related compounds and TLR3, found on natural killer cells, recognizes double stranded RNA; a molecule only present in some viruses. Taken together the 10 TLRs recognize features that are typical of most pathogens and thus can respond to the presence of many different infections. When a TLR on a macrophage is activated, a response cascade ensues inside that cell that causes the production of inflammatory cytokines. These cytokines are secreted into the environment and precipitate a series of responses, most importantly being the recruitment of neutrophils to the affected area. The infiltrating cells further the inflammatory response and this is described in section 15.5. This inflammatory signal by macrophages is one of the bodies best defenses against infection and marshals the rest of the immune, both innate and adaptive immunity. Adaptive immunity has a different approach than innate immunity. It most strongly reacts to proteins, but will also react with other macromolecules, even though these structures are made by every living thing. It's solution is to create a huge population of cells (lymphocytes) that collectively are capable of responding to many macromolecules, both those that are part of our bodies (self) and those of invading pathogens (non-self). Self, in these terms, means the proteins, sugars and lipids floating around that are part of our body and are accessible to the immune system. The key step occurs during the maturation of these lymphocytes. Those cells that respond to self-macromolecules are eliminated or suppressed, while those that do not react to self are allowed to mature. In this way, the immune system learns to tolerate the host: the assumption is that any immune cell that survives this process will respond only to non-self macromolecules. The macromolecule it reacts with may be present in the outside world, potentially part of a pathogen. If that molecule enters the body, the cells that recognize it will activate and alert the immune system, eventually raising an immune response. But how do these cells recognize macromolecules? Before we tackle that question, let us first describe these non-self macromolecules in more detail. Immunologist call these macromolecules antigens. Antigens are defined as any type of molecule that causes an immune response in a host by interacting with antigen-specific receptors on the membrane of host lymphocytes. Proteins by far are the strongest antigens, followed by sugars, lipopolysaccharides and then lipids and DNA. This arrangement makes some sense since it is loosely based on the uniqueness of the molecule in each species. Protein structures tend to have distinct characteristics in each organism. Carbohydrates are less distinctive, and lipids and DNA are nearly universal in structure. Therefore, it is wise for the immune system to focus on proteins when trying to identify foreign macromolecules. Host T cells and/or B cells recognize these molecules as foreign and then marshal an immune response against them. So how do lymphocytes recognize these antigens? By using antibodies and T cell receptors. Antibodies are a class of proteins made by plasma cells (a type of differentiated B cell) that each contain a unique variable region that recognizes just one antigen. 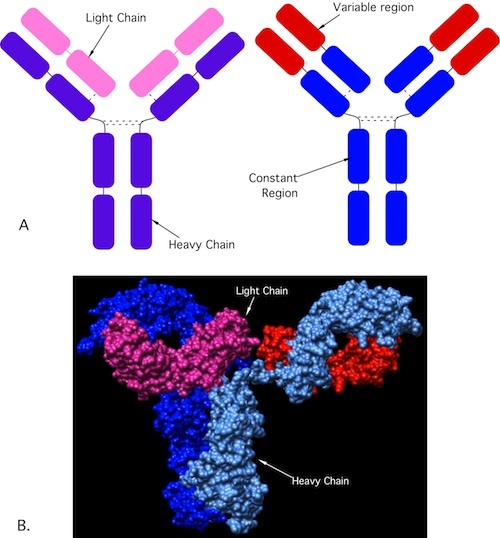 Figure 15.1 shows the structure of an antibody. Your body is capable of making millions of different types of antibodies and together they are capable of recognizing almost any substance that is non-self. You need this tremendous variability to respond to the numerous antigens encountered in a lifetime. B cells use membrane-bound antibodies that act as receptors for foreign antigens. When membrane-bound antibody receptors on B cells recognize their antigens, they bind to them and trigger the B cells response, with the eventual synthesis of antibodies. A second line of defense are T cells. These also recognize antigens through proteins on their surface called T cell receptors. T cell receptors have several antibody-like features and their binding of antigen is somewhat analogous to that seen with antibodies. Once a T cell binds an antigen, it excites the rest of the immune system to attack the source of the antigen. T cells are also the part of the immune system that destroys cancer cells and cells taken over by viral infection. The big picture is that the immune system recognizes invaders by the antigens they carry using antibodies and T cell receptors and then enlists a whole collection of cells and proteins to rid the body of the pathogen. Our immune system has evolved over time and involves many different systems. The patchwork nature, where many of the functions appear to overlap and address similar needs, is a reflection of this build up over time. The key aspect of the immune system is its ability to recognize self from non-self, and then to inactivate the non-self entity. The molecular representation of this non-self is the antigen. An antigen is any molecule that raises an immune response and this is most often a protein. Once detected, a large arsenal of systems are brought to bear on any invader and this response involves two types of cells, B cells, that differentiate into plasma cells and create antibodies against antigens, and T cells, that direct the rest of the immune system. T cells are also important in dealing with cells infected with intracellular parasites and cancer cells. 5. Why do small multicellular organisms only have simple, less effective methods of repelling microbes? Why not have the more powerful methods of vertebrates?